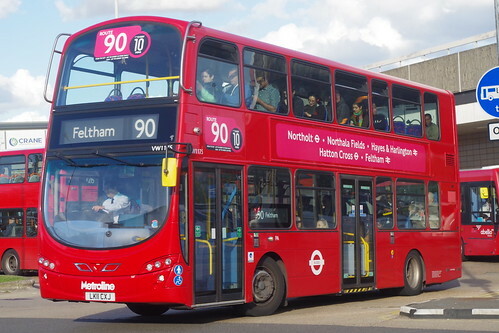 This was the renumbering of the 90B and transferred to London Buslines under tender. Withdrawn between Richmond and Kew which was replaced by new 391 - but extended at all times from Yeading to Northolt. Diverted at Hayes via Coldharbour Lane instead of Church Road in order to serve new Sainsbury's Store at "The Grapes". Route transferred from Buslines to Metroline. Diverted at Feltham to Browells Lane - Leisure West - the withdrawn section being covered by new 490 Richmond and Hatton Cross. Rerouted via Eastern Perimeter Road between Hatton Cross and Harlington Corner upon closure of Eastchurch Road. New Quality Incentive Contract using new vehicles. 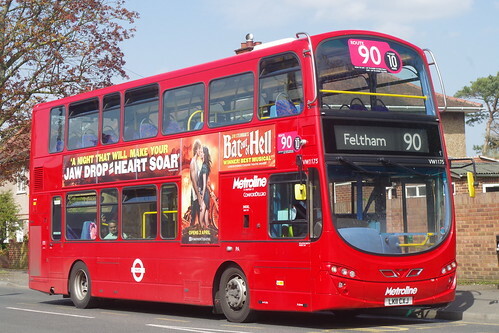 The same bus as above but a nearside shot at Hatton Cross showing the full treatment . I had never heard of Northala Fields ? Changeover point Northolt Station stand or at base using ferry bus between North Wembley and Northolt.